Freesia is a genus in the Iridaceae family of about 14 species from southern Africa, mostly from the winter rainfall region of South Africa. An important resource for this genus is the 2010 monograph by Manning and Goldblatt. 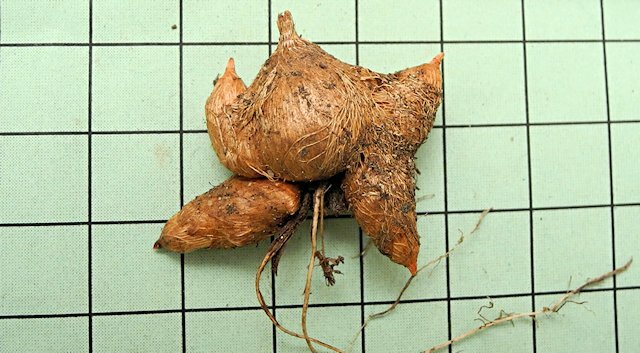 The rootstock is a conical corm, differing in species mostly by either finely or coarsely fibrous tunics. 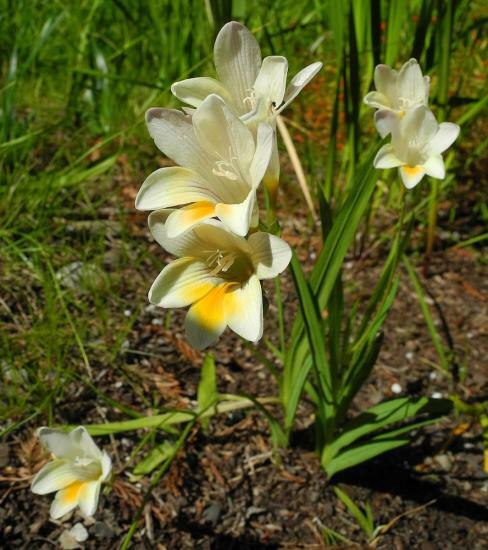 In an older delimitation of this genus, species were mostly cream colored or white with yellow markings, scented with funnel-shaped flowers. 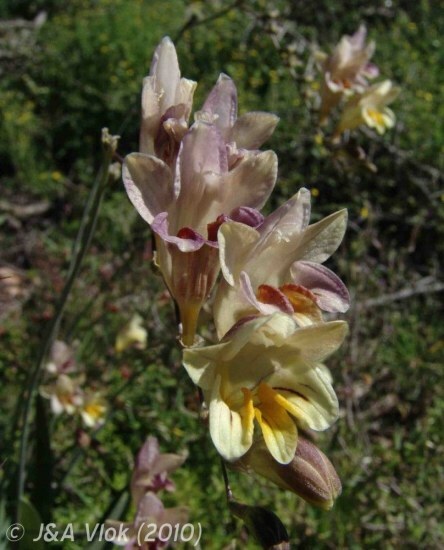 Anomatheca was included bringing in the two red summer rainfall species, Freesia grandiflora and Freesia laxa, and two other Cape species with narrow flower tubes, Freesia verrucosa and Freesia viridis. 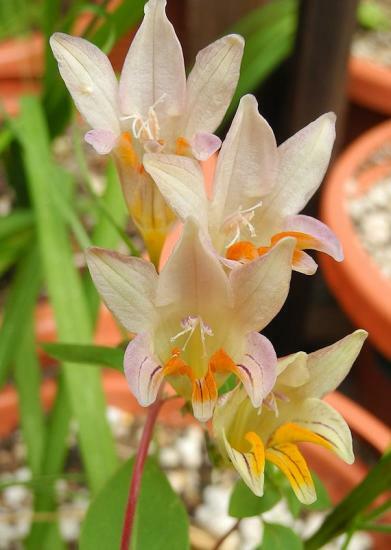 This genus has a long history of hybridization and cultivation in Europe and is one of the more horticulturally important genera in the family with its many different colorful (yellow, blues, pinks, white, orange) fragrant flowers popular as cut flowers. 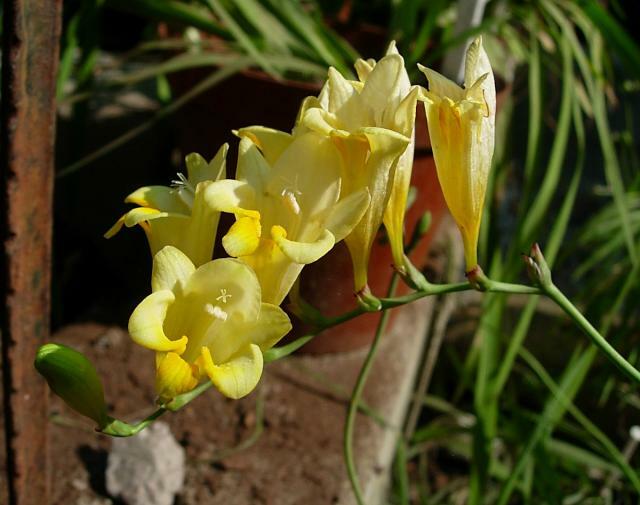 The cultivated freesias are hybrids that are polypoloid and more robust and taller than their ancestors, but often not as fragrant. They are best grown in mild climates and less suitable for cold or dark winters and areas of summer rainfall. More information about hybrids is found below. Some hybrids may be virused and therefore not long lived garden plants. 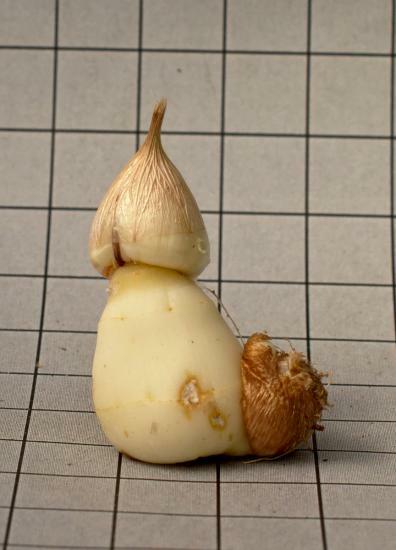 A photo from Janos Agoston illustrates a virused cultivar. 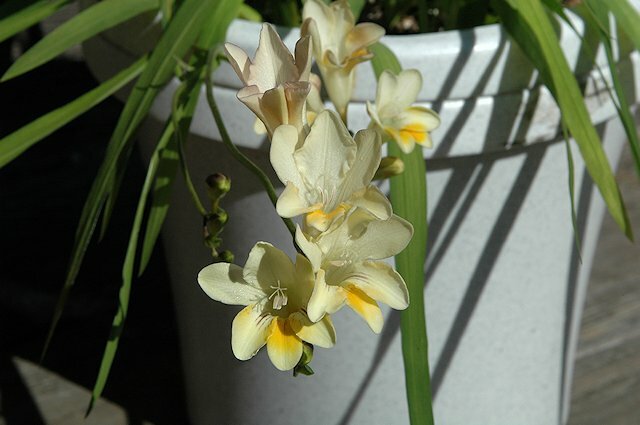 Freesia is easy to grow from seed, often flowering in one to two years and the summer growing Freesia laxa often reseeds in locations where it is happy. It is also one of the species that has different color forms and has led to interesting hybrids between them. 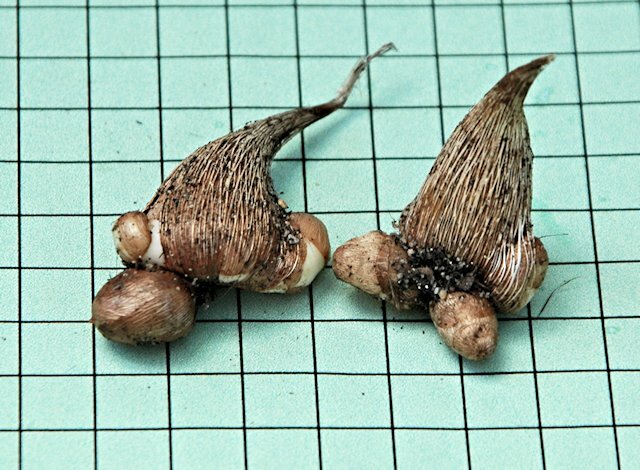 Most species produce cormels which can be grown on to flowering. 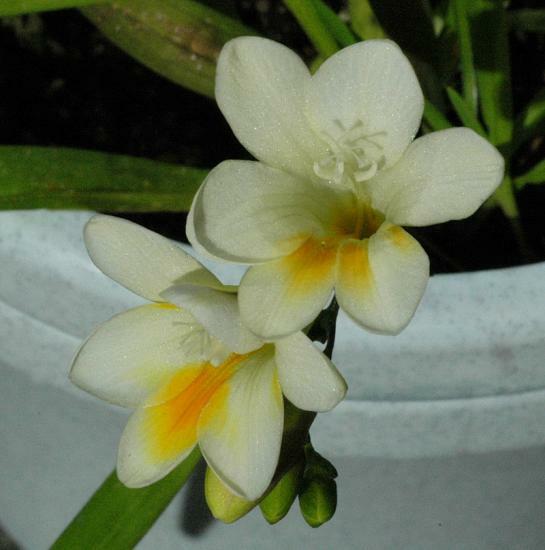 Freesia alba (G.L.Mey.) Gumbl., syn. 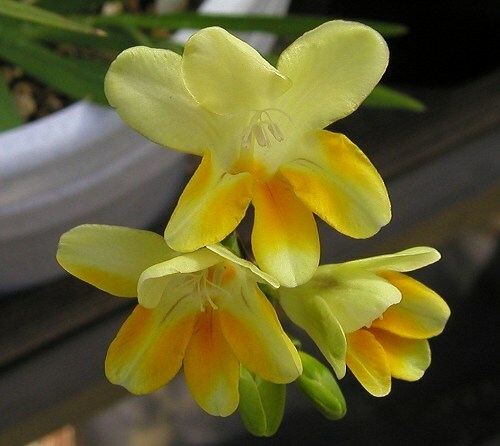 Freesia picta N.E.Br., is a very fragrant mainly coastal species from the winter rainfall regions growing in sandy or stony soil. 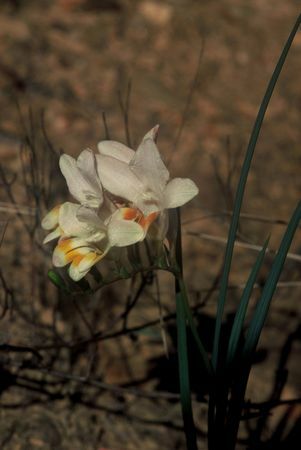 This species is now considered by Manning and Goldblatt to be a subspecies of Freesia leichtlinii. 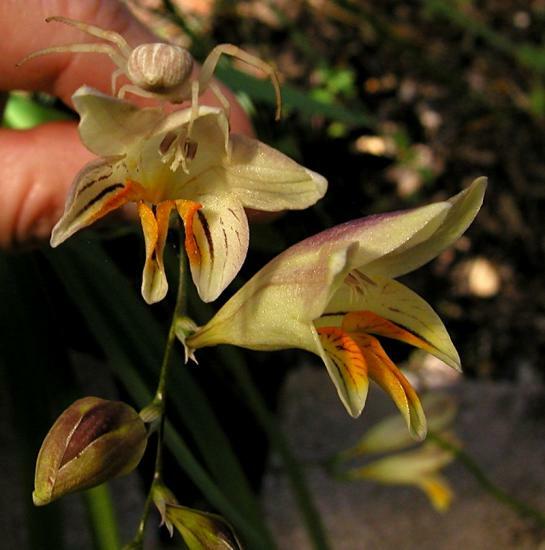 Freesia andersoniae L.Bolus is the only gullet-flowered species that occurs out of the winter rainfall area of South Africa. It is scattered across the central interior of South Africa and is typically restricted to the lower southern slopes of the dolerite and dolomite outcrops, wedged among rocks where there is protection from predators and cooler root temperatures and more moisture. Corms sprout with summer or fall rainfall, but flowering does not occur until spring, August to October but sometimes as early as May. This species is reported to be frost hardy. 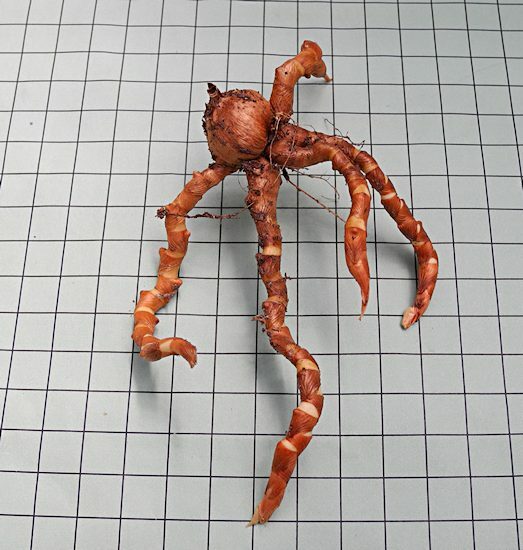 Growing 10 to 25 cm high, this species has 10 to 14 inclined to suberect leaves and 2 to 5 flowers in a spike, Flowers are 5 to 6 cm long, white to cream colored with the base of the lowermost tepal and inner edges of lower lateral tepals flushed orange. All three lower tepals have a dark brownish midline with purple chevrons in the tepal sinuses. 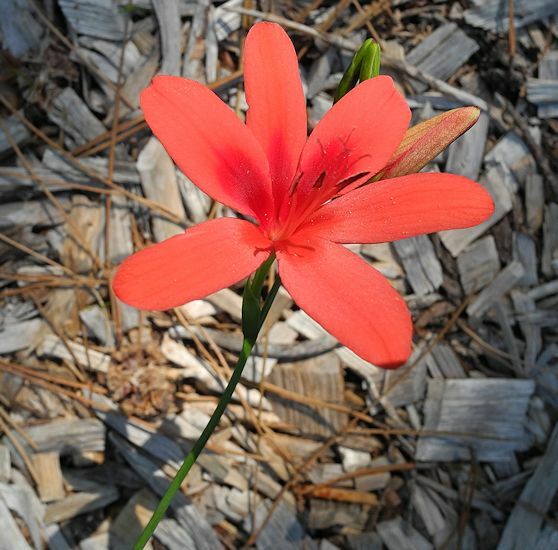 Flowers are strongly lily scented, even at night which suggests they may be moth pollinated. 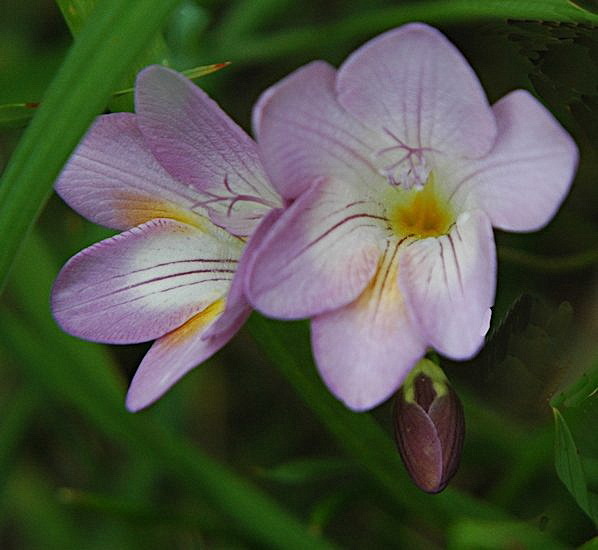 It is similar to Freesia speciosa but has longer and narrower, acute leaves and the internally marked purple lines. 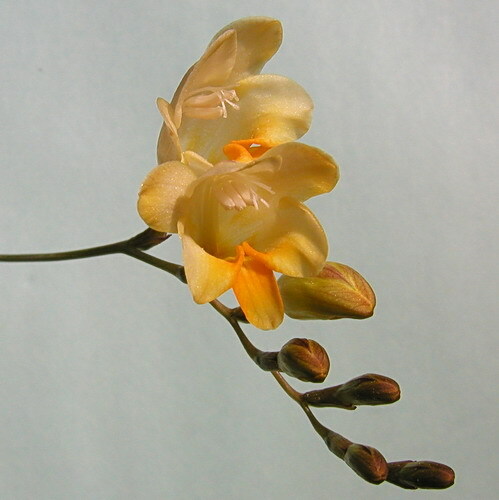 Freesia caryophyllacea (Burm.f.) N.E.Br., syns. Freesia elimensis, Freesia herbertii, Freesia parva and Freesia xanthospila, is distributed on gravely clay soils in renosterveld, near the coast in sandy soil in fynbos or thicket, and in loamy pockets along the edges of scrub on limestone ridges in the Southwestern and Southern Cape. This species is usually prostrate, 3 to 10 cm tall, with a 3 to 10 flowered spike that bends downward in a curve of usually violet scented flowers. 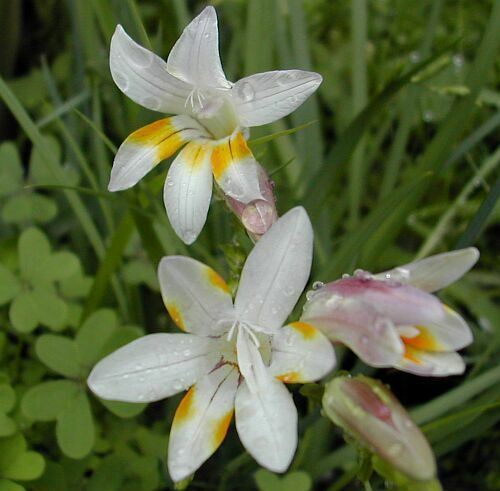 Flowers are 3-4 cm long, white, flushed purple on the back, with the base of the lower tepals marked yellow orange, usually with a dark midline. Flowering occurs about a month after the first rains in fall, April to June. As might be expected considering that it is found in such diverse habitats, there is great variation in plants in this species. Leaves can be short and blunt in a prostrate fan on the ground in exposed situations or narrow and acute to suberect or upright in shaded situations under shrubs. Although the inflorescence is usually almost horizontal, it can be suberect in suitable situations. Flowers can be barely scented or unscented as well. How many and which of the lower tepals are marked in yellow or orange, sometimes fading to chestnut, varies as well. 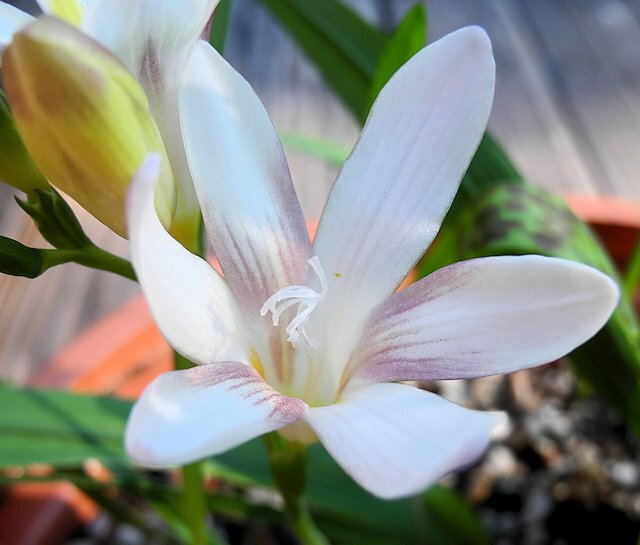 This species is distinguished from Freesia alba by its time of flowering, from Freesia fucata by its broader leaves and lack of tricuspidate bracts, and from Freesia marginata which has leathery leaves with a distinctive submarginal vein. 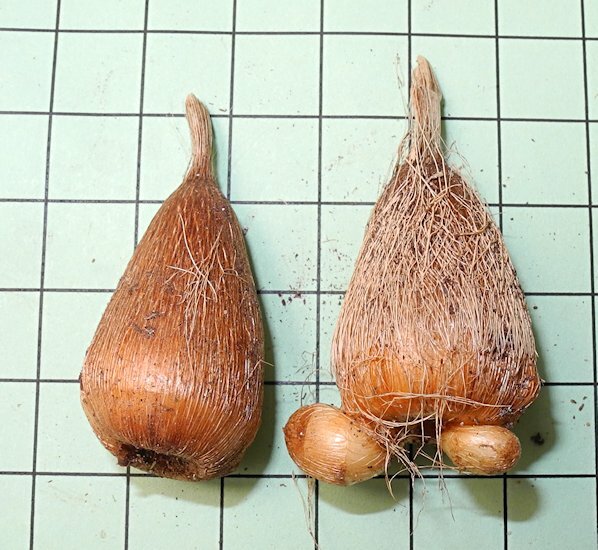 It is more difficult to tell apart from Freesia praecox which has soft fine, textured corms, suberect leaves that taper evenly to acute points and is usually only marked on the median lower tepal. The first two photos were taken in the Overberg by Cameron McMaster. The third photo was taken by Rod Saunders. 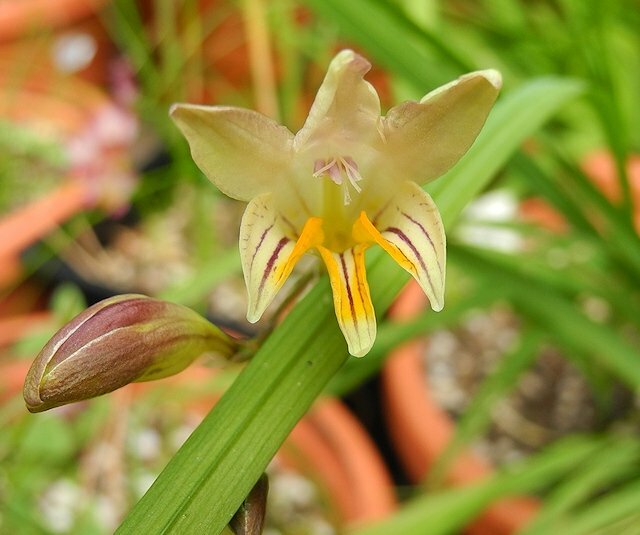 Photos below were taken by Mary Sue Ittner who grew them from seeds identified as Freesia elimensis. This species was originally described in 1933 by H.M.L. 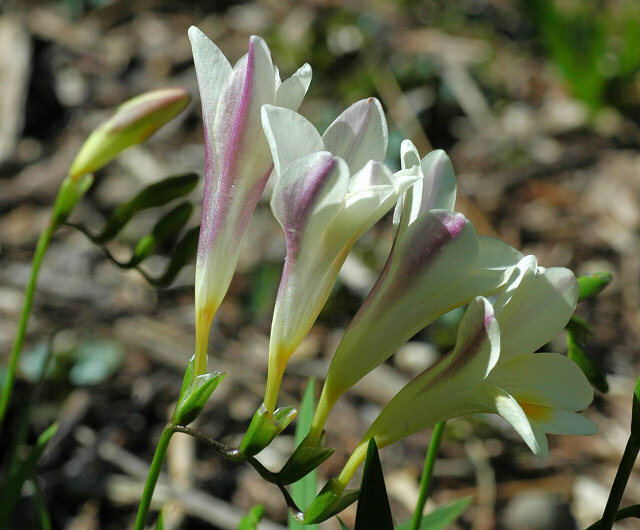 Bolus but included as a form of Freesia caryophyllacea by Goldblatt and Manning in 2000. 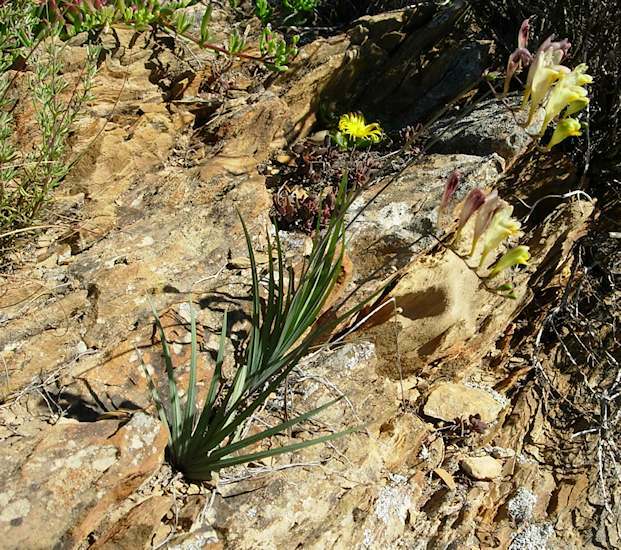 This form was found on limestone ridges around Bredasdorp and coastal rock outcrops around Hermanus and it has narrower lanceolate leaves that are acute and flowers with just the median lower tepals marked with yellow. It flowers in April and May. Although the seeds germinated well, and plants grew well, they did not flower. The first two photos were taken October 2014 when they finally flowered. 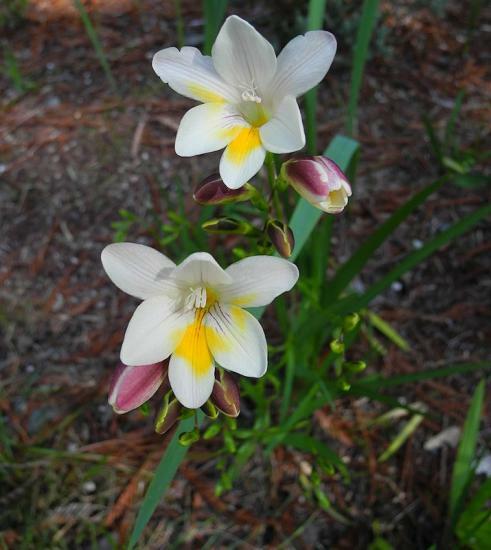 Although the flowers look just like the description of the flowers for Freesia praecox, her plants had fewer leaves (5-7) versus 6-9 and up to 11 for Freesia praecox and bloomed in fall instead of winter. The last photo shows the corms on a 1 cm grid. 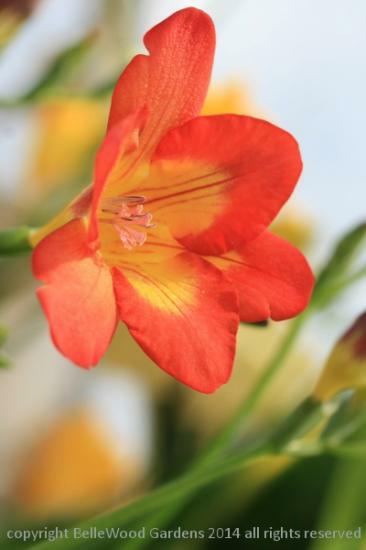 Photos below are of plants grown from seeds from a reliable source labeled Freesia fucata. 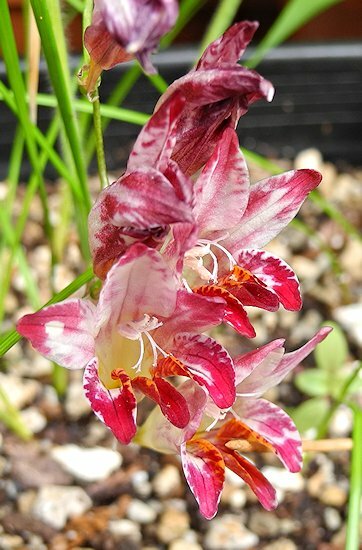 Reading the monograph referenced above and using the key, I believe they are more likely another untypical form of Freesia caryophyllacea. 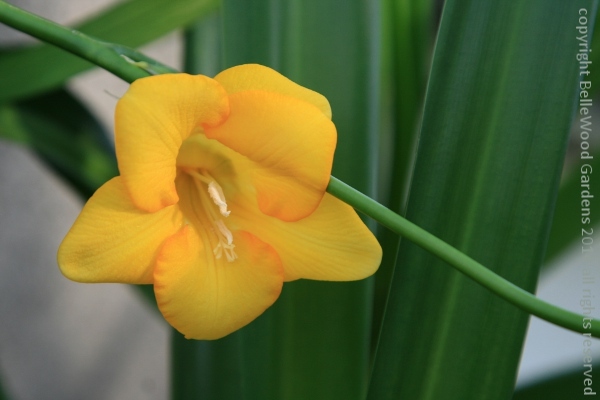 The leaves are much wider than the description of Freesia fucata and only the middle lower tepal is yellow. Flowering occurs October to December in the Northern hemisphere. The flowers are nicely scented and leaves and flowers more erect than the usual form. 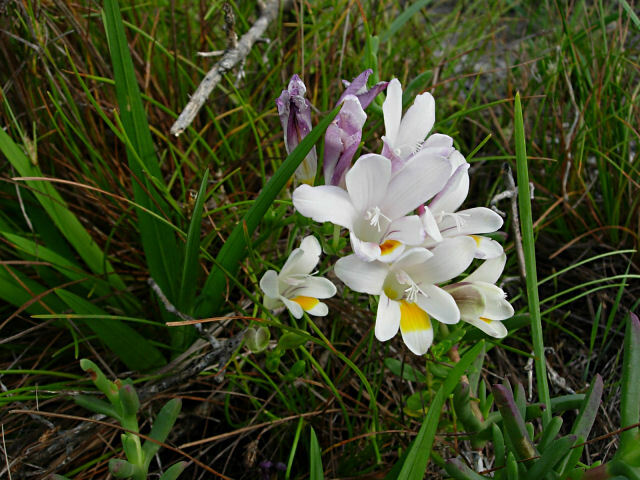 The monograph describes plants from coastal outcrops near Hermanus that were once described as Freesia alba, but now considered to be this species. This form lacked the axillary cormels of that taxon and flowered earlier in June and July, had suberect leaves and just the lower median tepal marked. The first photo was taken in 2003 by Bob Rutemoeller. The other flower photos were taken by Mary Sue Ittner in 2014 and show a flower when it has first opened and later when the yellow color is fading, and a flowering stalk with some flowers having yellow on just one of the lower tepals, but one flower with yellow on each of the lower tepals. Photos taken by Mary Sue Ittner show the bracts, a leaf backlit, and the corms on a 1 cm grid. 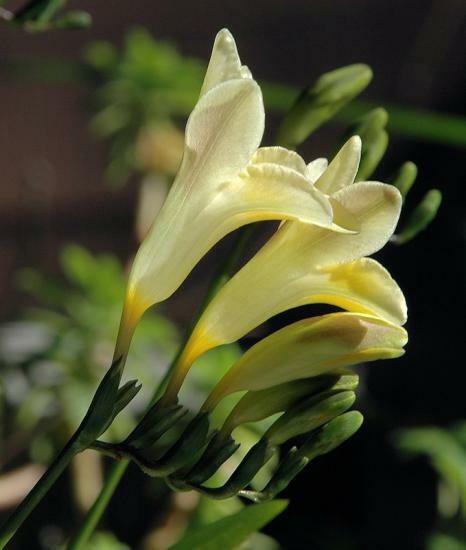 Freesia corymbosa (Burm.f.) N.E.Br., syns. 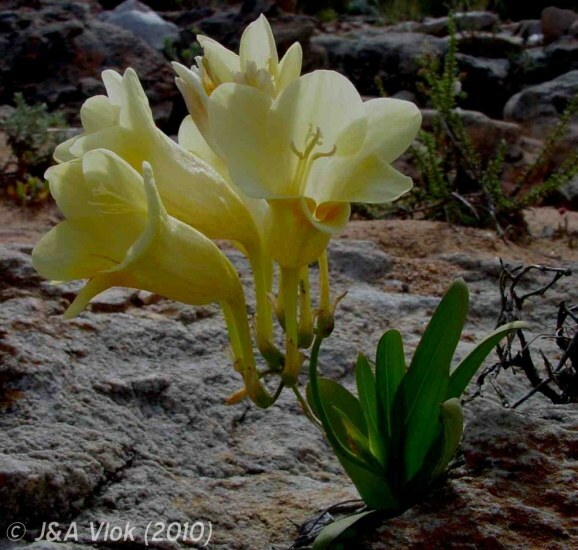 Freesia armstrongii, Freesia aurea, and Freesia metelerkampiae, grows on loamy or sandy soils in open renosterveld and succulent Karoo scrub or grassy fynbos in the southern Cape. Growing from 15 to 40 cm, this species has conical or globose corms with medium to coarse textured fibers and 7 to 10 erect lanceolate leaves with acute tips. The flowering spike is horizontal or deflexed and usually 6-10 flowered. 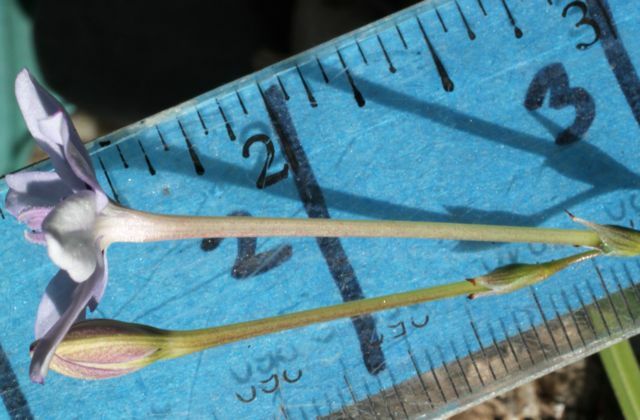 Bracts are important in distinguishing it from Freesia refracta. They are obtuse, tipped dark brown. Flower color is variable, with various shades of yellow or rarely white or rose or deep pink with the base of the tube and lowermost tepals and inner margins of lower lateral tepals bright yellow to orange. 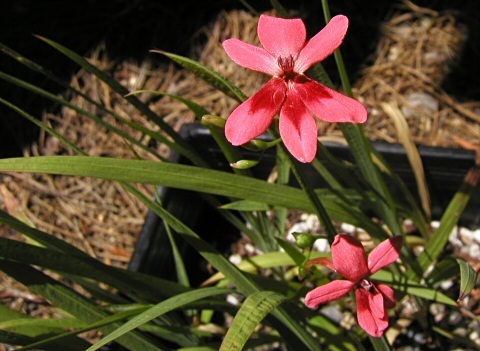 Pink flowered plants were used in hybridization. The first three photos by Cameron McMaster. The fourth photo from the book Plants of the Klein Karoo courtesy of Jan and Anne Lise Schutte-Vlok. 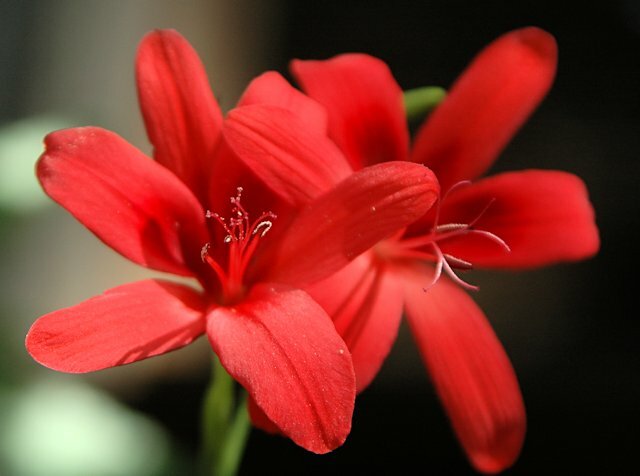 The last two photos were taken by Mary Sue Ittner of flowers and corms (on a 1 cm square grid). This species doesn't seem to be very happy in her winter wet Northern California garden, but occasionally blooms. 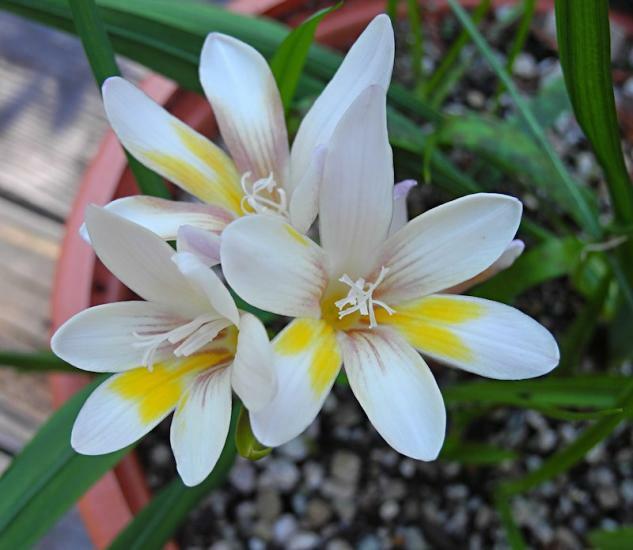 Freesia fergusoniae L.Bolus is found on clay soils in Renosterveld in the southern Cape where it blooms best in cleared or open sites. 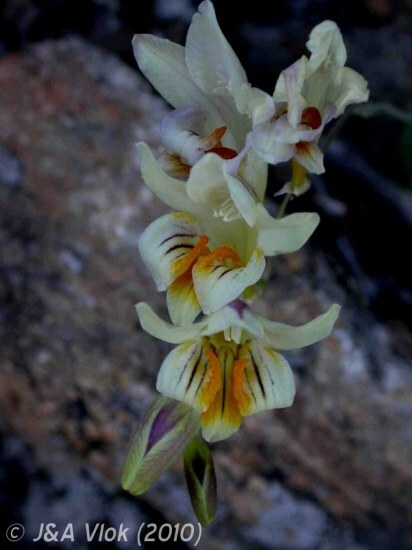 Growing from 6 to 20 cm, this species has 7 to 13 prostrate to inclined leaves and flowers in a horizontal or drooping spike, pale yellow to cream colored that are dull purple on the reverse with the base of the lower tepals marked orange. Corms are coarse textured and flowers are sweetly scented. Flowering is early, in winter, mid July to late August, and sometimes earlier. There is variation in the flowers from year to year and in new plants grown from saved seed. Photos by Mary Sue Ittner. Freesia fucata J.C.Manning & Goldblatt is a southwest Cape endemic found on clay slopes in the renosterveld, often along roadsides or in washes, blooming in winter (July.) Growing from 15 to 30 cm, this species has 5 to 6 inclined to suberect linear to lanceolate leaves tapering to a point that are almost as long as the stem, firm textured bracts that are green with a hyaline margin, and violet scented white flowers flushed deep purple on the reverse. The base of the lower tepals is marked yellow orange with a dark midline. This species is distinguished from other species that bloom at the same time by its narrow leaves (4-5 mm wide) and its tricuspidate bracts. Photos from Dirk Wallace. Freesia grandiflora (Baker) Klatt, syns. 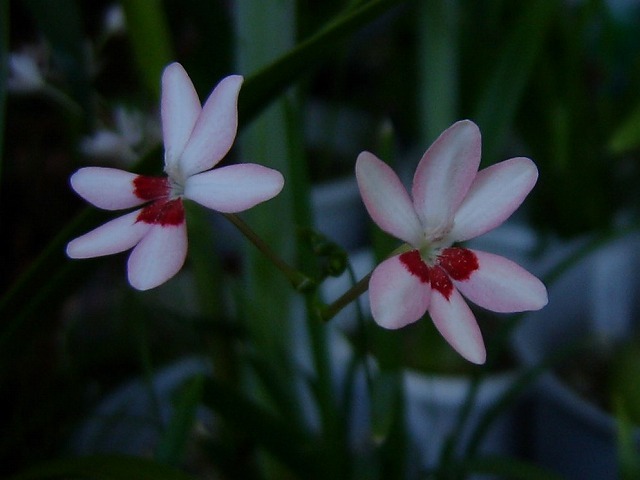 Anomatheca grandiflora, Lapeirousia grandiflora, and Freesia rubella, is a summer rainfall species (KwaZulu-Natal extending to tropical Africa) that blooms in spring. It typically grows in humus rich soils in scrub, deciduous woodland or more rarely forest, sometimes along streams. It prefers subtropical climates, but has also been found in temperate forests where in may occur in deep shade. 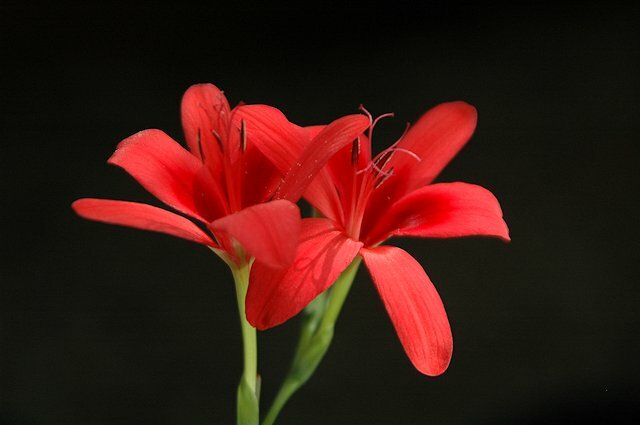 Growing from 20 to 60 cm, it has flowers that resemble Freesia laxa but are much larger, scarlet or sometimes pink with a darker red blotch at the base of the three lower tepals. Stems are usually unbranched, but can have up to 4 branches. The tube is more or less as long as the tepals or only slightly longer and the tepals are somewhat cupped and filaments exserted beyond the tube. 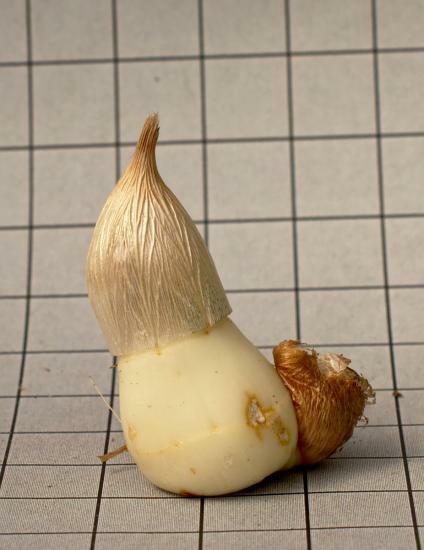 Corms are globose-conical. 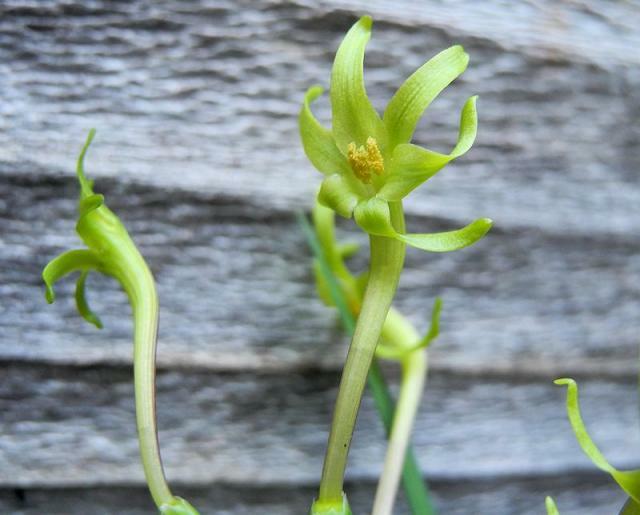 This species has an unusual feature in that it produces rhizomes late in the growing season giving rise to a terminal cormel at the end of the second season after which they wither and sever the connection from the parent plant. 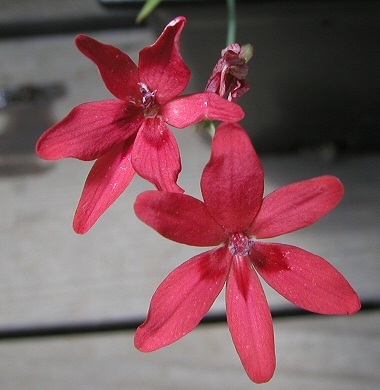 Seeds are deep orange to red, when fresh and then darkening. According to Graham Duncan in Grow Bulbs this species is ideal for growing in containers or woodland gardens in sun or light shade. In the Manning and Goldblatt revision an addendum included a new subspecies for this species based on a distinctive geographical location. The two subspecies are listed below. Freesia grandiflora ssp. 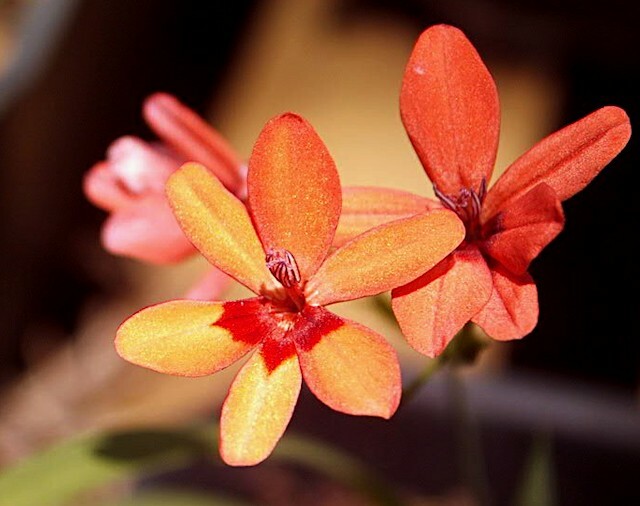 grandiflora is the type subspecies with bright red, rarely salmon pink, flowers that open fully and fully exserted filaments that are 15 to 25 mm long. Photo 1 taken April 2004 by Lee Poulsen. Photos 2-5 from Mary Sue Ittner. 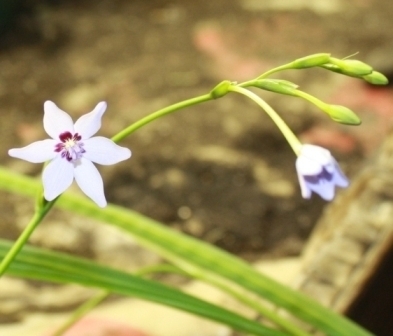 These flowers are much larger and the stems are branched and the bloom time is earlier and much longer than the Freesia laxa I have growing in my garden. It seems to be quite happy growing in a container in my greenhouse. 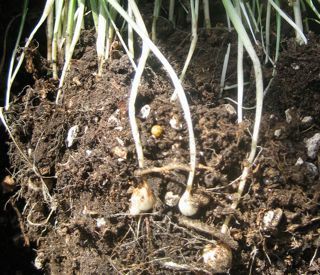 The last photo taken on a 1 cm grid in July shows a corm with the rhizomes attached. 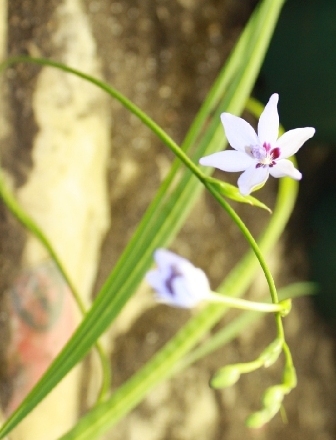 Freesia grandiflora ssp. occulta is found near Mocuba on the edge of the coastal plain in north central Mozambique. It occurs in mid altitude forest and woodland on granite derived soils and flowers in May and June. The typical subspecies does not occur in the area. 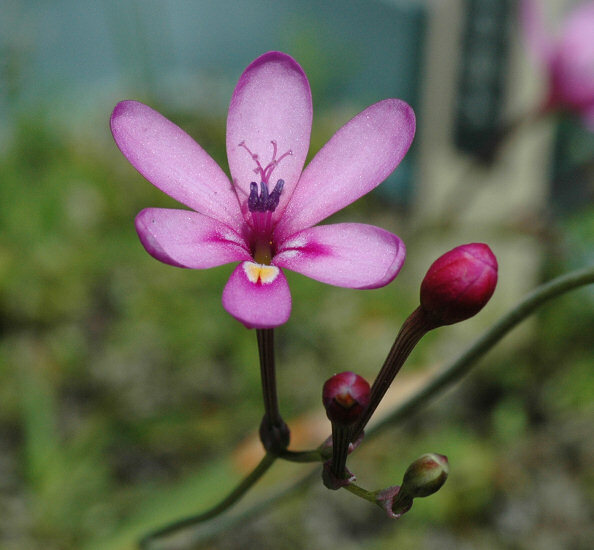 This subspecies differs in having pink flowers that sometimes do not open fully and filaments that are about 6 mm long and only exserted about 2 mm. Freesia hybrids Hybridisation of Freesia began after Freesia alba became available in 1878 when it could be crossed with Freesia leichtlinii. However significant progress required the introduction of rose pink and yellow forms of Freesia corymbosa at the start of the 20th century. The first three photographs by Judy Glattstein are of three cultivars, 'Ambiance', 'Port Salute' and 'Red River', flowering in her greenhouse in New Jersey in February 2014. 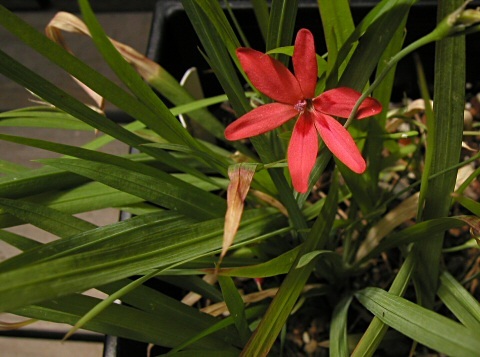 The last photo from Mary Sue Ittner is of an unnamed hybrid. 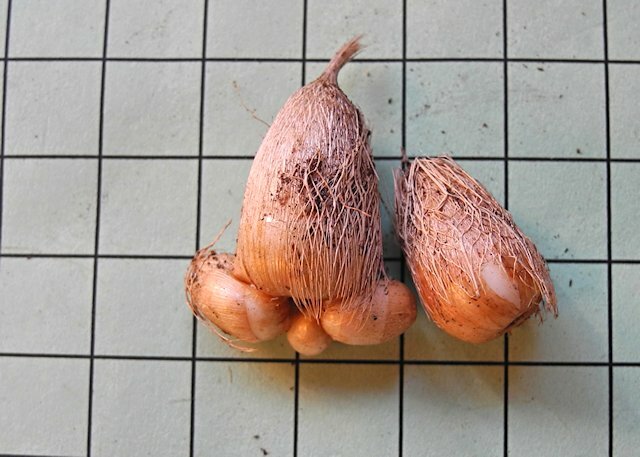 Hybrid corms are sold cheaply and some are heat treated so that they will start to flower once planted. As a result they can be grown as a summer flower in climates where they cannot be grown naturally in winter. Similarly seed can be sown in spring and will flower by the end of summer. In both cases after the first flowering corms will revert to their natural behaviour of flowering in winter. 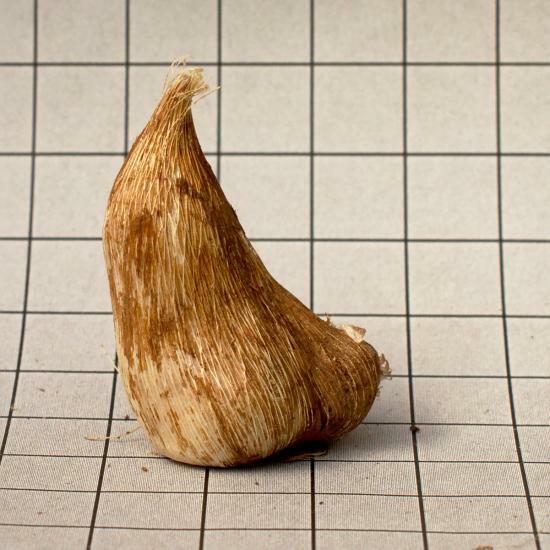 Photos by David Pilling of commercial corms bought from a supermarket; the sequence in photos 2-4 shows the results of peeling the tunic off one corm; all the grids are 10 mm. 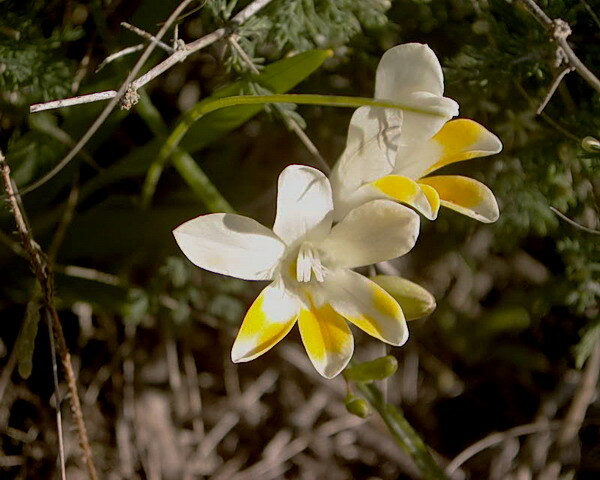 Freesia laxa (Thunb.) 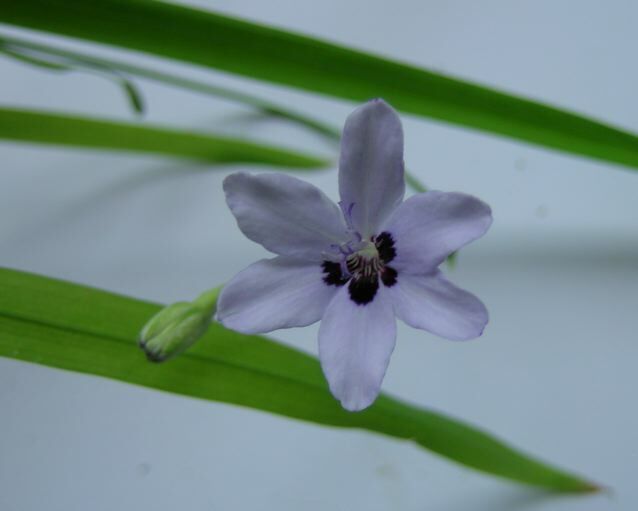 Goldblatt & J.C.Manning has been known by many different names (Anomatheca laxa, Anomatheca cruenta, Lapeirousia laxa). 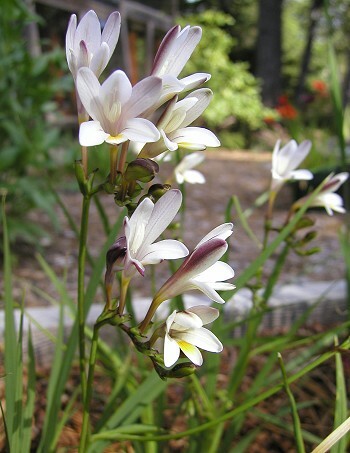 It is native to several countries in Africa and is a smaller version of Freesia grandiflora. 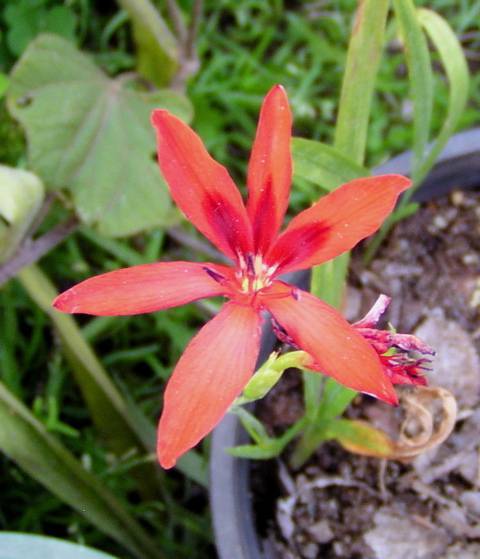 It is native to summer rainfall areas and has subglobose-conical corms and seeds that are bright orange or red when fresh. 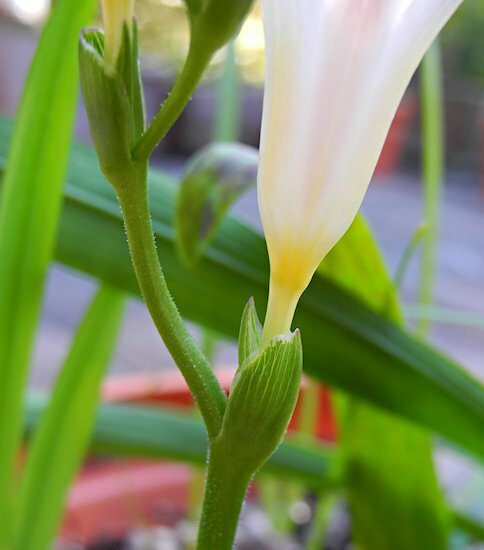 It has smaller flowers than Freesia grandiflora and has a tube that is more than twice as long as the tepals which spread horizontally from the base and filaments that are scarcely exserted from the tube. Freesia laxa subsp. azurea (Goldblatt & Hutchings) Goldblatt & J.C.Manning is a form with blue flowers and is often reported as more difficult to grow than some of the others. 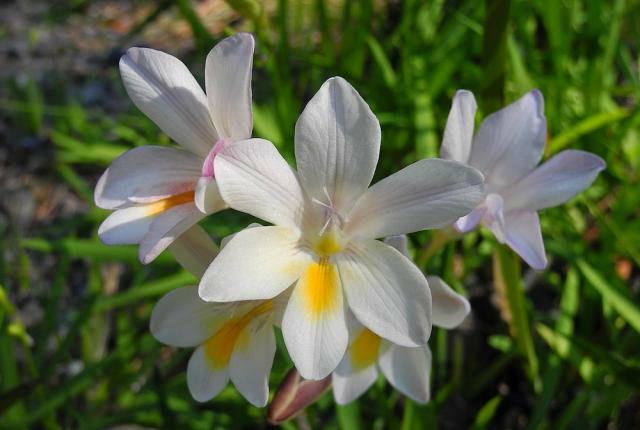 It is restricted to coastal habitats between KwaZulu-Natal and Mozambique where it grows in coarse sandy soils in exposed sites such as grassy dunes or in light shade. Unlike the other subspecies it flowers in winter and early spring between June and September. The first photo is by Sheila Burrow. The second photo is by Diane Whitehead grown from seeds in an unheated glasshouse in April. The seeds came from Sheila Burrow's plants. 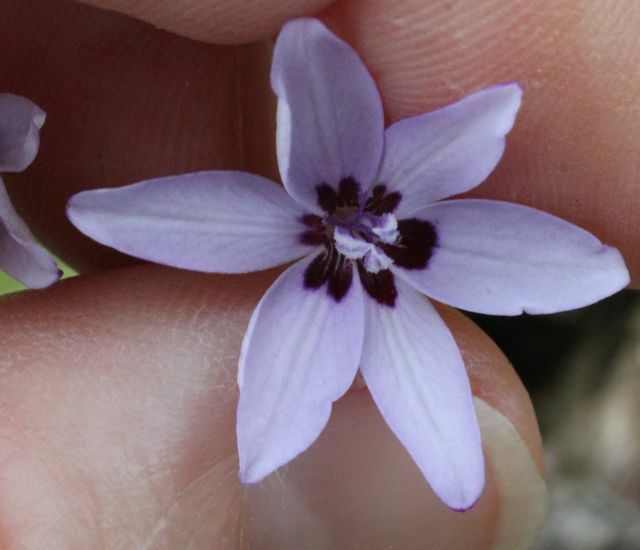 Notice that the petals have four marks vs. three seen in Sheila's specimen. In photos 3 and 4 taken by Darm Crook five of the six tepals are marked with red instead of purple. 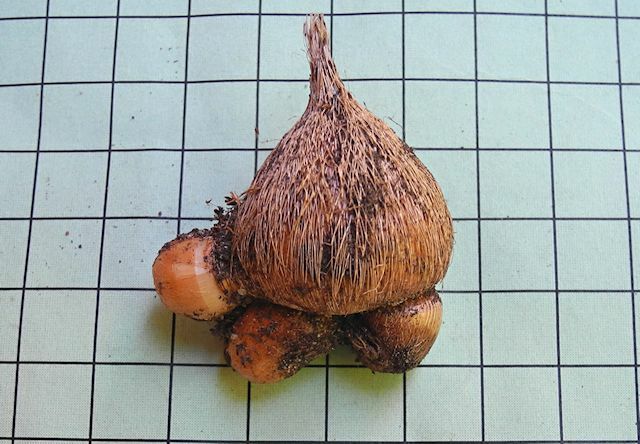 Photo 5 taken by Mary Sue Ittner of a corm with corms attached on a 1 cm grid shows a very different method of vegetative increase than the corms in her photo of Freesia laxa ssp. laxa which would lead to a more rapid expansion vegetatively. Photos shown below were taken by M. Gastil-Buhl of plants grown from seed outdoors under an arbor. 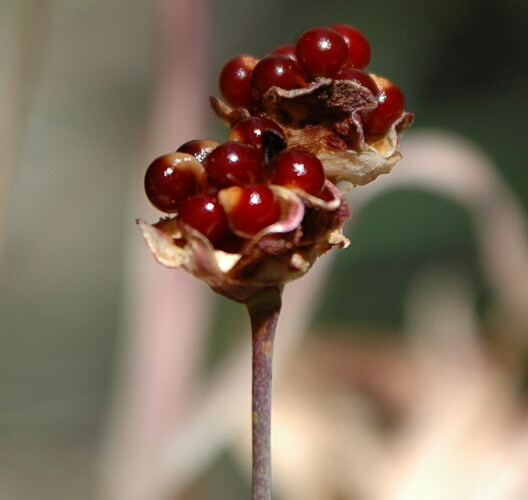 The first photo shows the red seeds and seed pods. The second photo shows the depth of corms grown in a terracotta pot from seed sown on the surface of this pot. In the third photo an unusual bloom has blotches on all six tepals. The fourth photo compares the color to blue paint-masking tape and measures the perianth tubes about 4 cm long. The undersides of the tepals are pale, almost white. 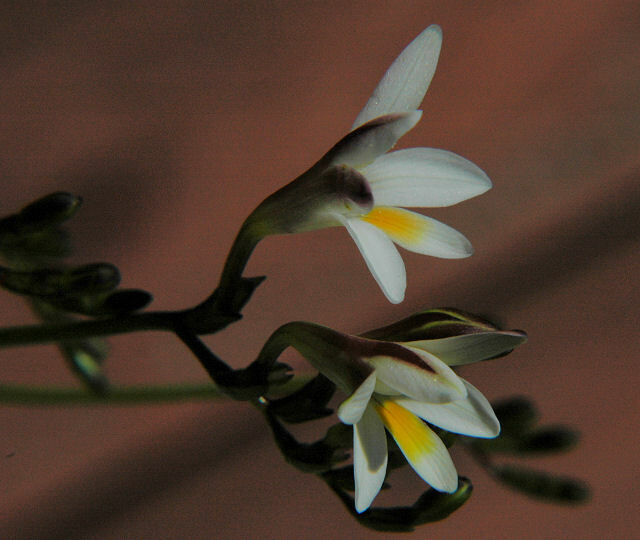 Freesia laxa subsp. laxa, the typical subspecies, is widely distributed along the eastern coast and near interior of South Africa extending into eastern tropical Africa to western Kenya, eastern Uganda and southern Sudan. It favors rocky habitats on the edge of bush clumps and afrotemperate forest and is also found in coastal forest and bush near sea level in KwaZulu-Natal. It blooms from August to January (peak flowering south of the equator is between November and January and May to July north of the equator.) The most common forms are red with darker blotches flowering late spring and summer. They bloom quickly from their bright red seeds and can be a bit invasive in situations where they are happy as they self sow. The first photo was taken by Cameron McMaster. Photos #2-5 were taken by Mary Sue Ittner. 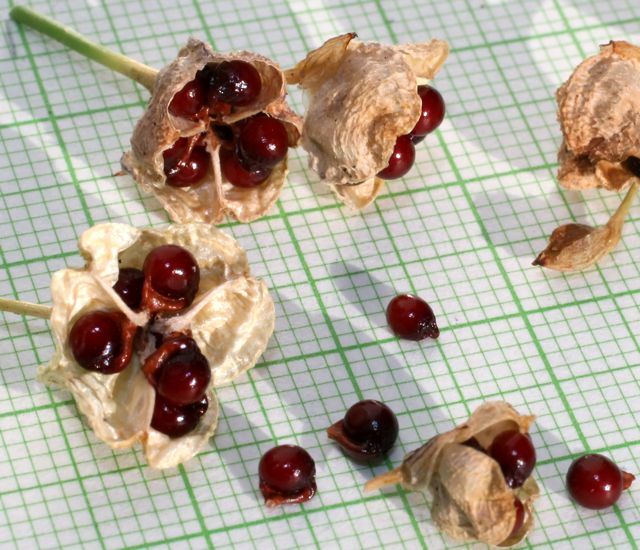 The photos below taken by Mary Sue Ittner are of the seeds and corms on a 1 cm square grid. 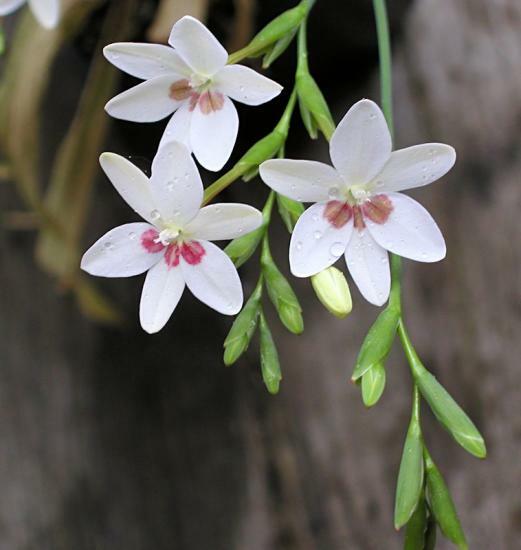 Freesia laxa 'Joan Evans' is a form with white flowers and a red blotch. The first photo from Cameron McMaster, the second from Mary Sue Ittner and the last two from Sheila Burrow, including one that does not have the white blotch. Photographs from Mari Kitama, 1-3 are of Freesia laxa 'Joan Evans' × Freesia laxa subsp. azurea. 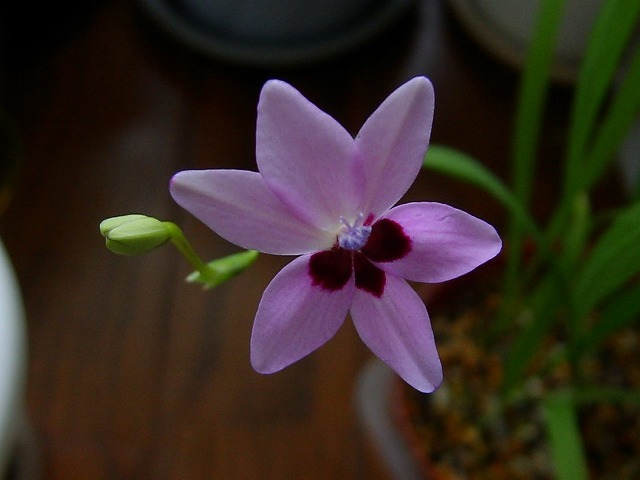 Its color is wonderful lavender pink and the flower is a little bigger than other Freesia laxa. 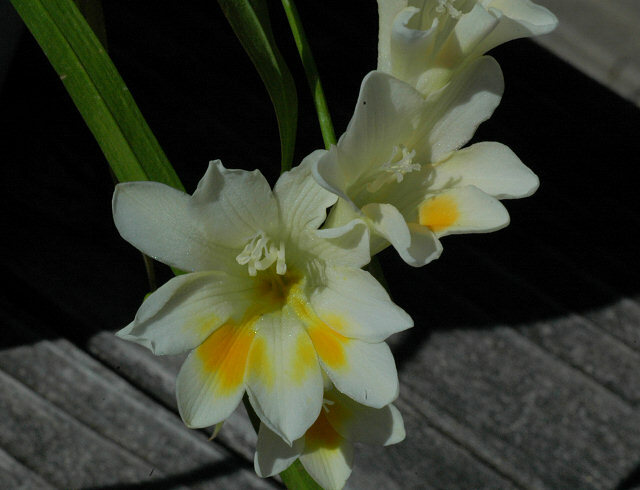 Photo 4 is of Freesia laxa 'Joan Evans' × Freesia laxa subsp. laxa (red). Freesia laxa 'Joan Evans' is the seed pod parent in these crosses. 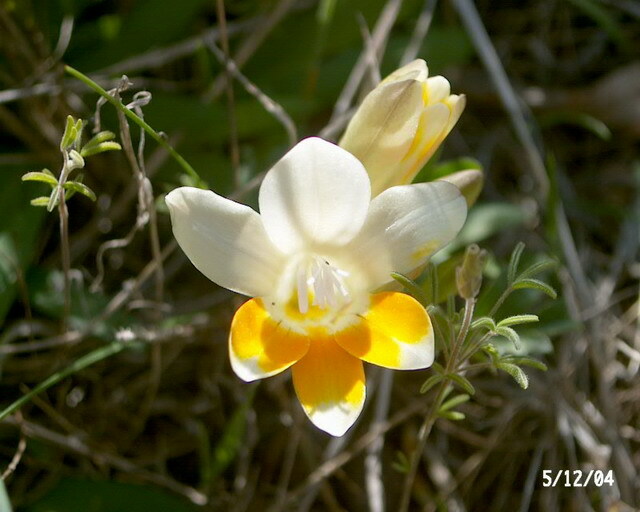 The photo below, from Jonathan Lubar, compares Freesia laxa ssp. 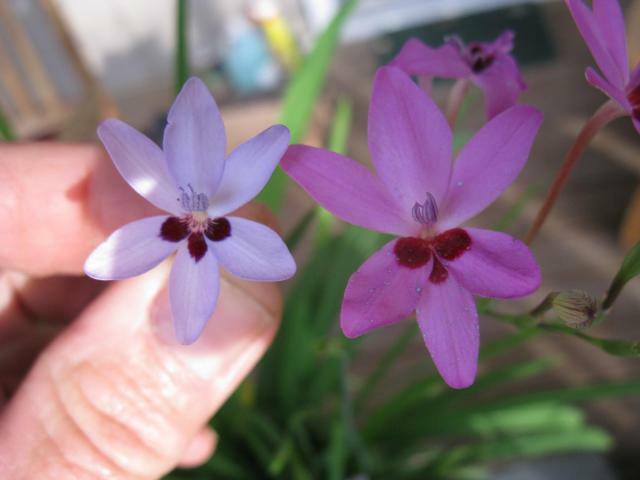 azurea (on the left) to Freesia laxa 'Sara Nobles', a flower that resulted from crossing Freesia laxa ssp. 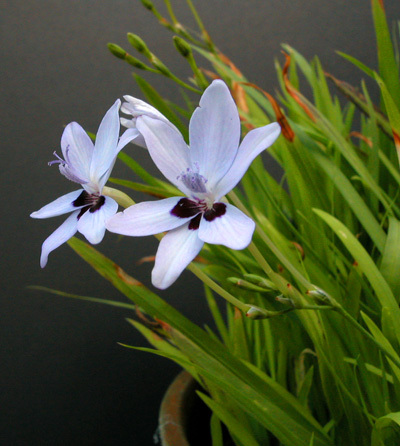 azurea x Freesia laxa ssp. laxa. The cross is substantially bigger than either parent and is a deep mauve in color. 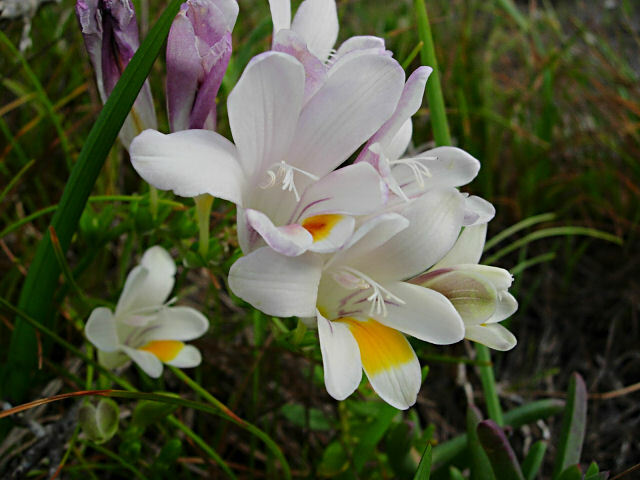 Freesia leichtlinii Klatt is a coastal species found in the southern Cape growing in sandy soils. 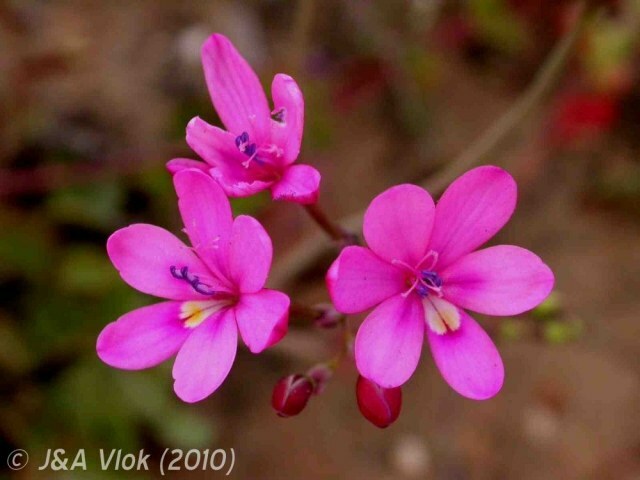 It is found in coastal bush, thicket or restioid fynbos. 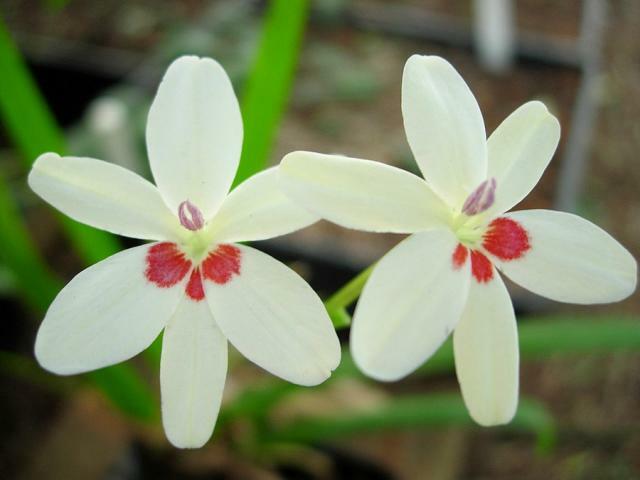 It grows from 6 to 25 cm high and has sword-shaped leaves and cream colored scented flowers with yellow markings. 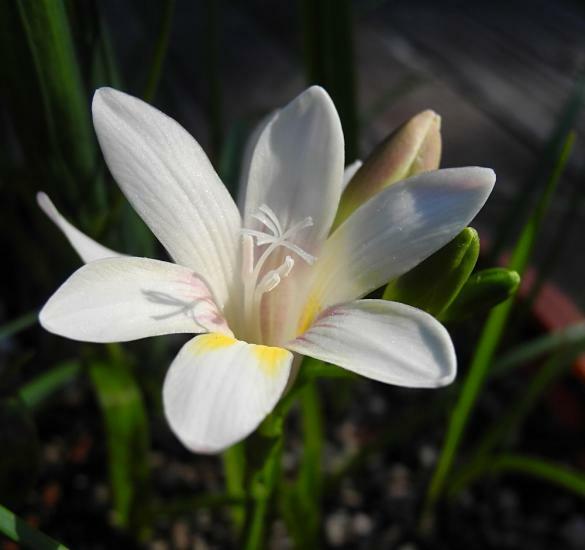 In the monograph, Botany and Horticulture of the Genus Freesia (Iridaceae) published by John C. Manning & Peter Goldblatt in Strelitzia (2010), the species Freesia alba has been included in this species as a subspecies. 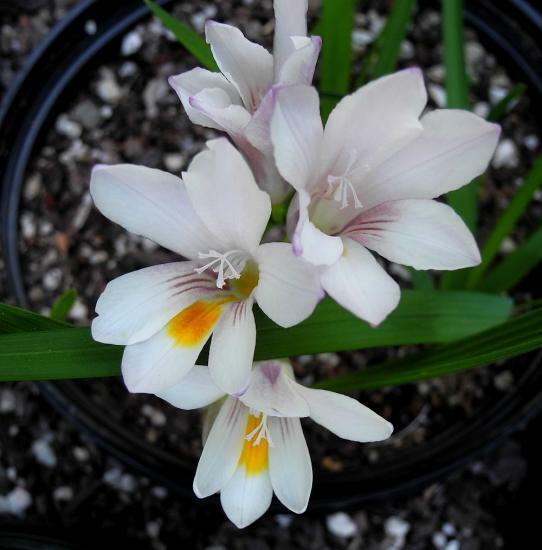 The photo below taken by Mary Sue Ittner is of plants grown from seed labeled by the source as Freesia leichtlinii. 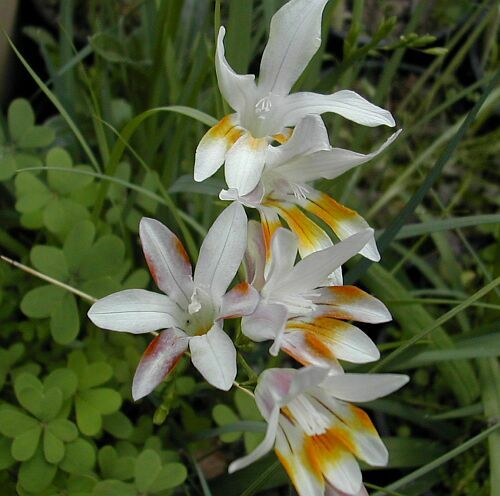 It was hard to distinguish from the plants naturalized in her garden that were received as Freesia alba. Since there is variation in amount of yellow to orange on the lower tepal(s) of the plants in her garden, she suspects that differentiating the subspecies if the tube is less than 25 mm might be a challenge. Freesia leichtlinii subsp. alba (G.L.Mey.) J.C.Manning & Goldblatt, syn. 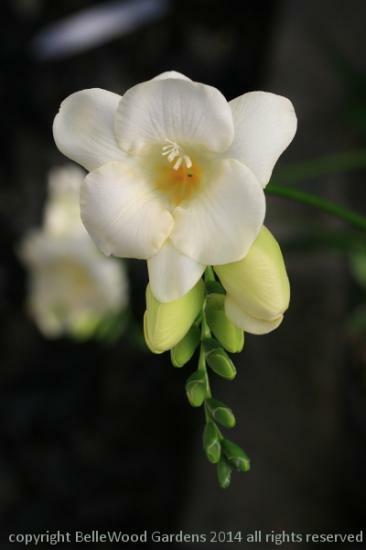 Freesia alba, is described as all white, or cream, flushed purple, usually with the base of only the lower median tepal marked yellow to orange. The tube is 20 to 40 mm long with the basal narrow part 5 to 20 mm. Growing from 20 to 50 cm, this subspecies has inclined or suberect leaves. It has smooth to slightly wrinkled seeds and flowers late July to early October. It has naturalized in coastal Northern California gardens, but may not be reliably hardy elsewhere. Photos by Mary Sue Ittner of flowers that have naturalized in her garden, growing both in sun and shade. There is also a picture of a flower with extra petals, one showing the purple backs, and the seeds next to the capsule (on a 1 cm grid). Photos from Cameron McMaster taken at Hermanus in the Overberg in habitat. 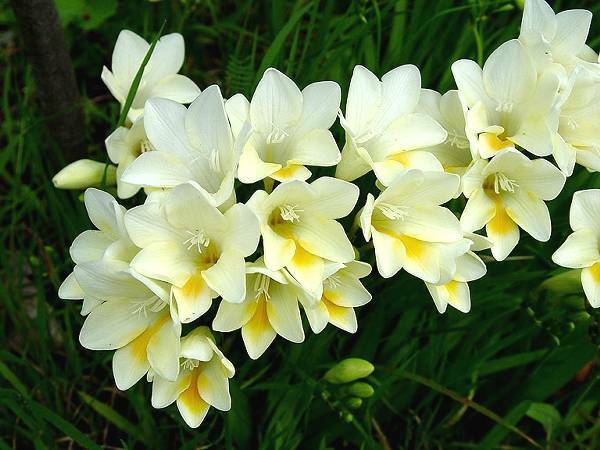 The sport, called Freesia alba 'Burtonii' arose in New Zealand and is very widely grown there. 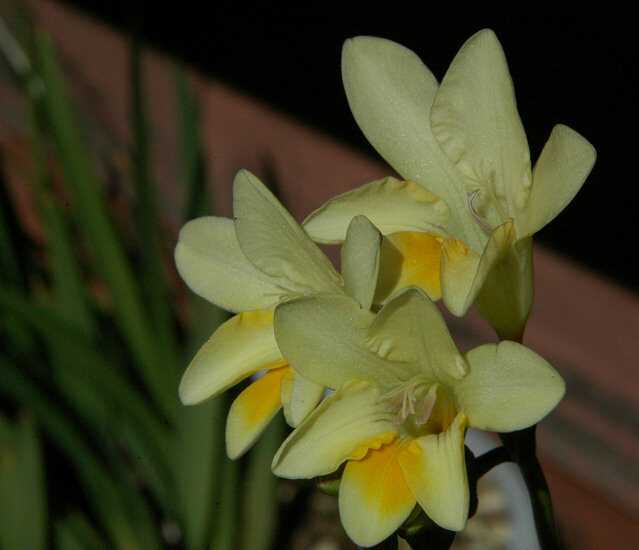 The flowers are creamy yellow and lack the purple flush in the top petal. This is a photo of a naturalised clump in a garden in Whakatane, NZ, taken on 11th September 05. Photo by Peter Richardson. Freesia leichtlinii subsp. leichtlinii, syns. 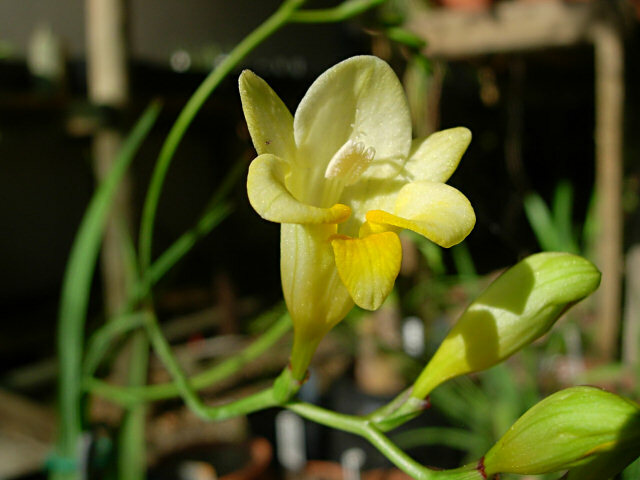 Freesia muirii and Freesia middlemostii, is described as pale yellow or cream, lightly flushed purple outside, with base of lower three petals marked deep yellow to orange and the perianth tube 20-25 mm long with basal narrow part 5-9 mm long. It has wrinkled seeds and flowers early August to late September. 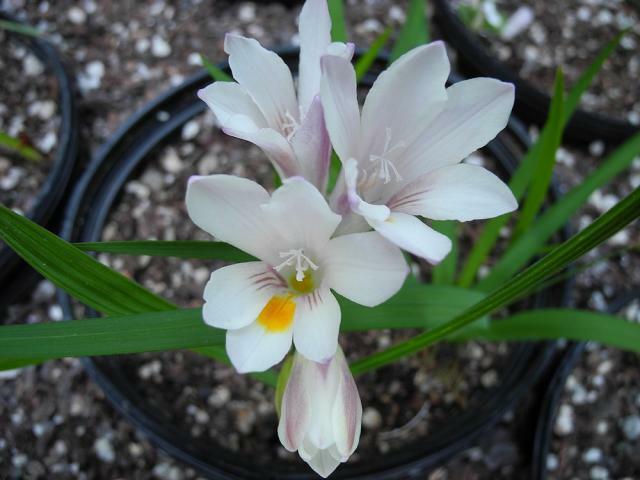 Freesia marginata J.C.Manning & Goldblatt was described in 2005. It is a highly localized species found in the Breede River Valley between Worcester and Robertson in the southwestern Cape where it grows in gravelly or stony washes in decaying sandstone. The corms are deeply buried in sandy loam in rock crevices. 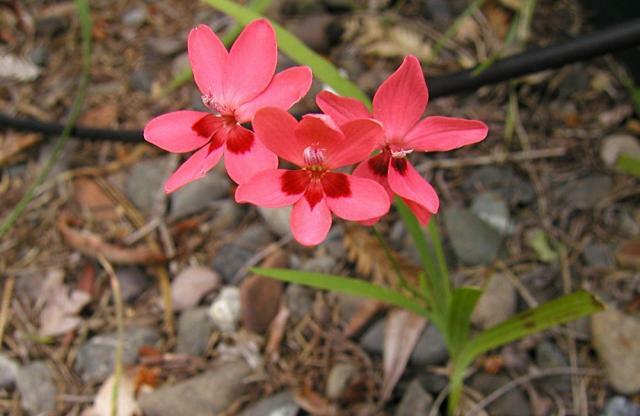 Growing from 4 to 10 cm, plants are typically low growing with prostrate leaves and flowers. Flowering takes place in early winter, May to June. Flowers are white, flushed purple on the back with the base of the lower tepals marked yellow orange and usually with a dark midline and are strongly violet scented. 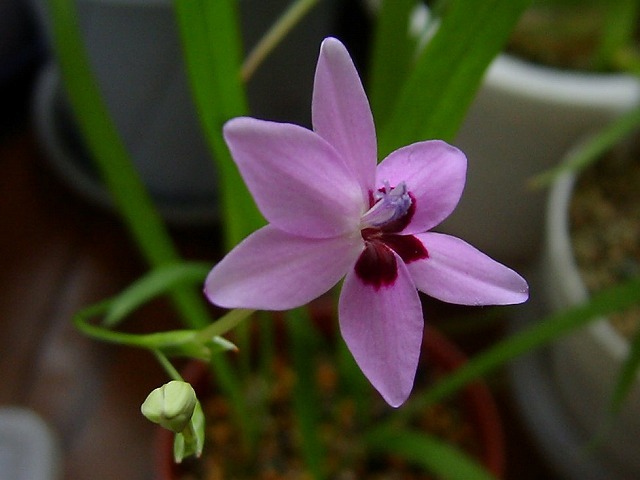 This species is very similar to Freesia caryophyllacea in flowers, early flowering time, and prostrate habit, but the leaves are different. The leaves of Freesia marginata are leathery, glaucous with an inconspicuous pseudo-midrib and with a prominent submarginal vein. 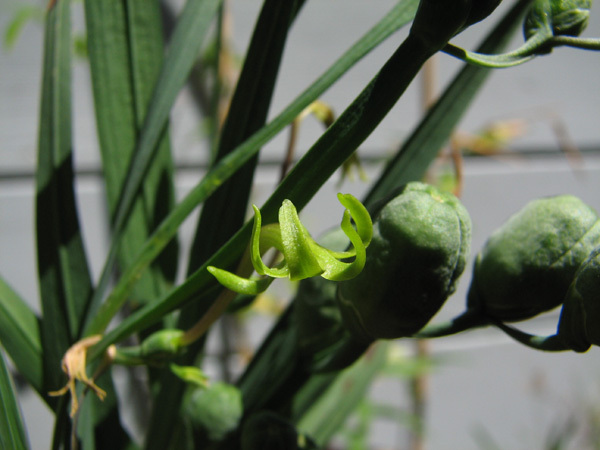 The leaves of Freesia caryophyllacea are bright green and softer with a prominent midrib. Freesia occidentalis L.Bolus, syn. 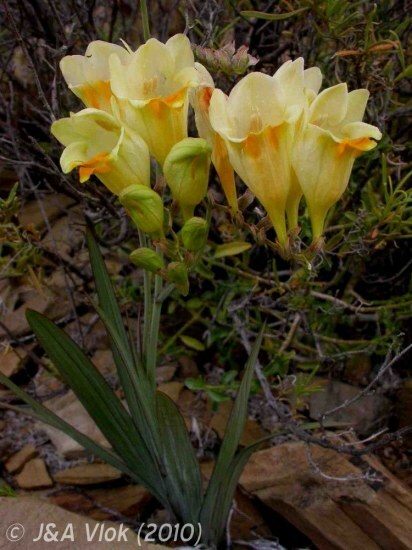 Freesia framesii, grows from 9 to 50 cm high and is found in the arid basin southwest of Calvinia to the eastern margins of the Cederberg and Swartruggens mountains east to Laingsburg (northwest Cape to the western Karoo). It grows in arid fynbos in stony, mainly sandstone soils or in low shrubland in dry loamy soils along foothills where renosterveld grades into succulent karoo, preferring south-facing slopes. It flowers mid August to September. Leaves are usually shorter than the flowering spike with the tips more blunt rather than sharp. Bracts are membraneous becoming dry and translucent or flushed pink. The fragrant (rosy violet with peppery overtones) flowers are in an inclined or horizontal spike and are creamy white to pale creamy yellow, sometimes flushed mauve or pink. The lowermost tepal and the inner margins of the lateral tepals are bright yellow and all three have a dark purplish midline. It can be distinguished from Freesia corymbosa by its bracts and from Freesia refracta by its broader less acute leaves. Photo by Rod Saunders. 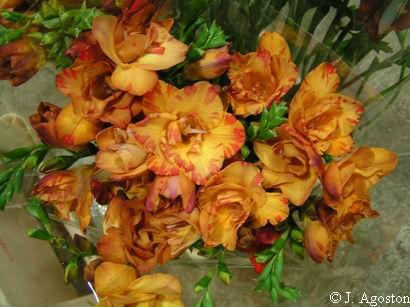 Freesia refracta (Jacq.) Klatt, syn. 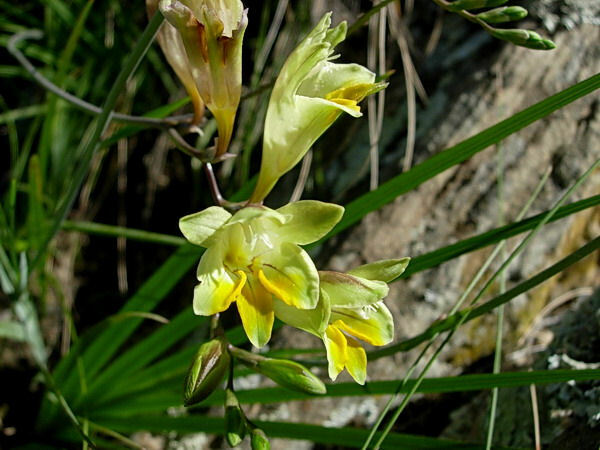 Freesia hurlingii, is found on dry stony slopes and flats in the southwestern Cape and also the Little Karoo. It is relatively common and found on many soils including shales, sandstone and on limestone outcrops. It usually grows from 15 to 40 cm high with 7 to 10 erect narrowly lanceolate-attenuate leaves and a horizontal to deflexed spike of 5 to 10 flowers. Flowers are 25-35 mm, pale greenish yellow or dull white flushed purplish on the reverse and the base of the tube. 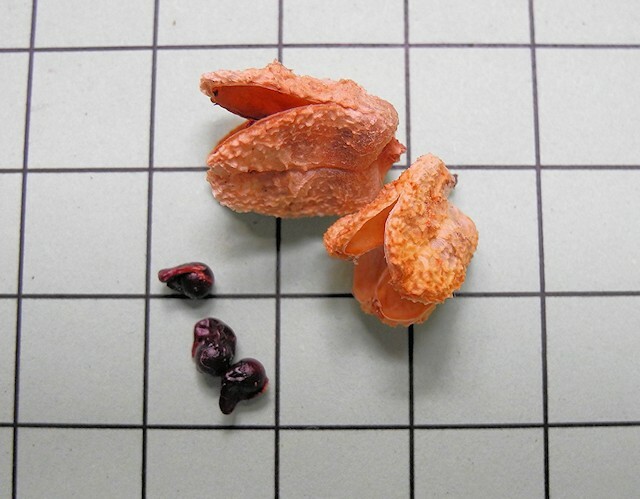 The lowermost tepal and inner margins of the lower lateral tepals are bright orange with all three lower tepals having a dark brownish midline. Flowers are unscented or strongly scented of rose and violet. Freesia refracta can be distinguished from Freesia corymbosa by its uniformly pale bracts. The bracts of the latter are tipped with brown. This species is listed on the Virus page as being susceptible to virus. Flowering time is July to September. The first two photos taken by Cameron McMaster in the Overberg. The last two photos from the book Plants of the Klein Karoo courtesy of Jan and Anne Lise Schutte-Vlok. Photos by Bob Rutemoeller and Mary Sue Ittner. 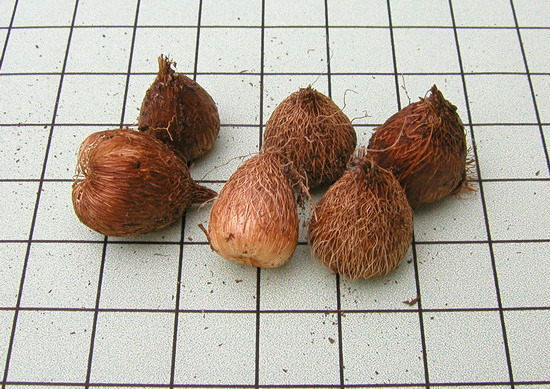 The fifth photo shows the corms on a 1 cm grid. 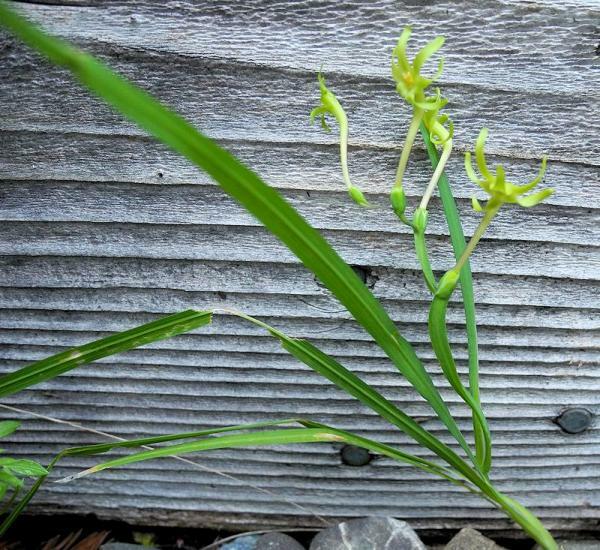 The last photo shows a plant with flowers that at first looked normal, but later looked virused. 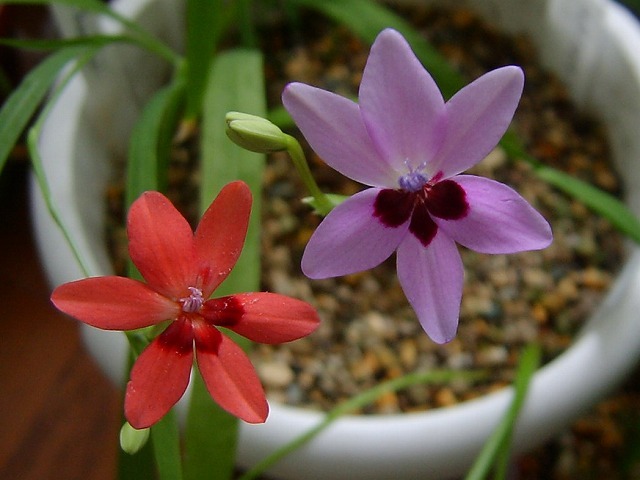 Freesia sparrmanii (Thunb.) N.E.Br. 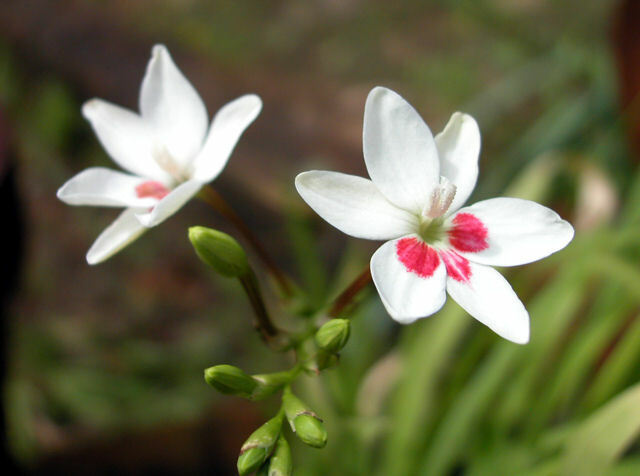 is found on forest margins and in clearings on the forest floor in localized populations growing in moist loamy clay in the southern foothills of the Langeberg (Southwest Cape). 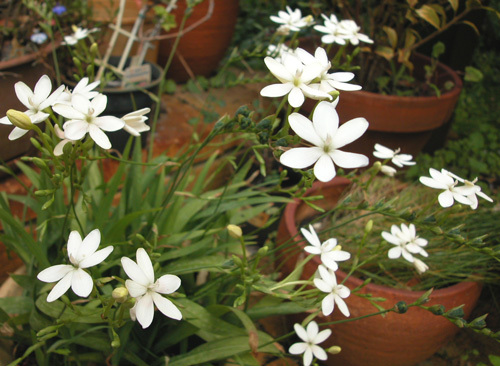 Plants grow from 11 to 25 cm with 5 to 9 erect linear to lanceolate leaves and a branched spike of deflexed small (35 to 40 mm) unscented white flowers, flushed dull purple on the reverse. The base of the lower medial tepal has an oblong yellow orange mark in the midline. In addition to the smaller size of the flowers which is a distinguishing feature, the lower portion of the funnel shaped tube of the flowers is as long or longer than the upper portion. Flowering occurs in spring, September to October. The spelling of this species is confusing. This species was named after a Swedish naturalist, Anders Sparrman, who discovered it in 1775. Thunberg used the spelling "sparrmannii" and you can still find it spelled this way in many books and botanical databases. Manning & Goldblatt follow the Code of Botanical Nomenclature using the customary spelling of the personal name and in their monograph spell it with a single n and this has become the accepted spelling by many. This species has been a reliable plant in a Northern California garden blooming every year but not increasing much. Photos by Bob Rutemoeller and Mary Sue Ittner. The last shows the corms on a 1 cm grid. Freesia speciosa L.Bolus, syn. 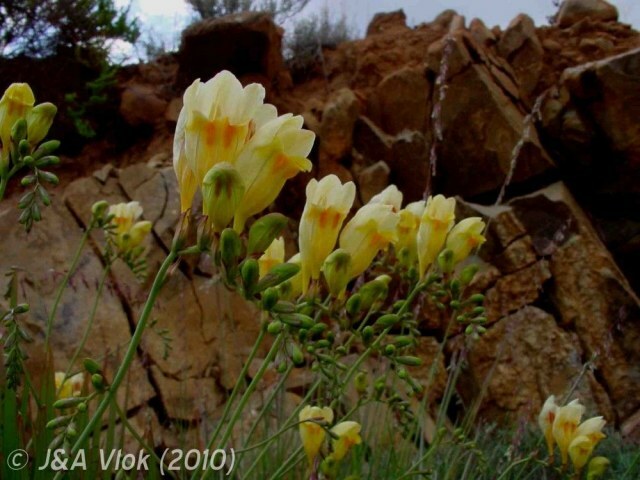 Freesia flava, is endemic to a few populations in the western Little Karoo where is occurs in Karroid shrubland in shale-derived soils on stony flats or with corms wedged in cracks on south facing sandstone cliffs. It is threatened by overgrazing. Growing 11 to 20 cm tall, this species has broad blunt, often somewhat succulent leaves. The usually simple, but sometimes branched spike has 3 to 6 large (5 to 7 cm) pale creamy yellow flowers with the base of the lowermost tepal and inner edges of the lower lateral tepals flushed orange. 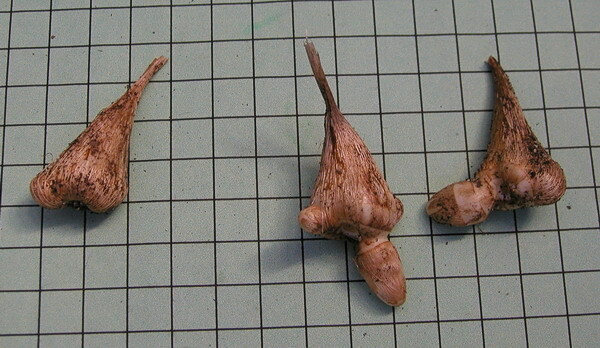 All three lower tepals have a brown midline; the lower lateral tepals are oval to almost round. The tube is funnel-shaped with the lower portion widening into a flared upper portion. 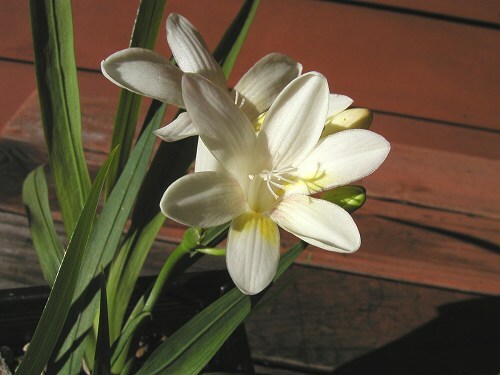 This species is lily scented and remains fragrant at night when the sour, bitter aspect disappears, leaving a cleaner scent. It blooms late winter to early spring, mid August to September. 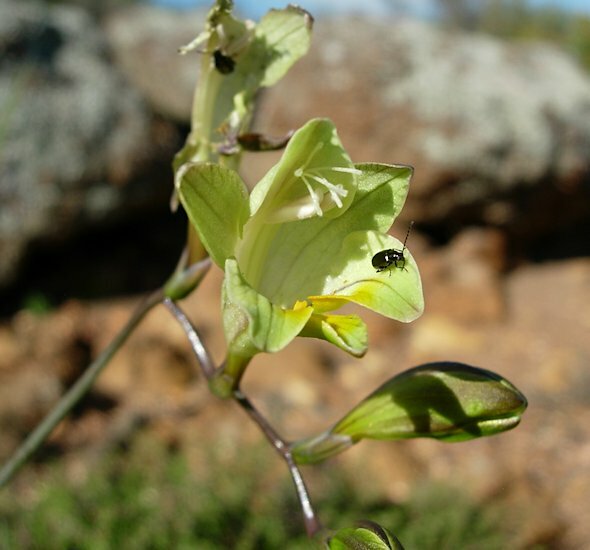 Photos from the book Plants of the Klein Karoo courtesy of Jan and Anne Lise Schutte-Vlok. 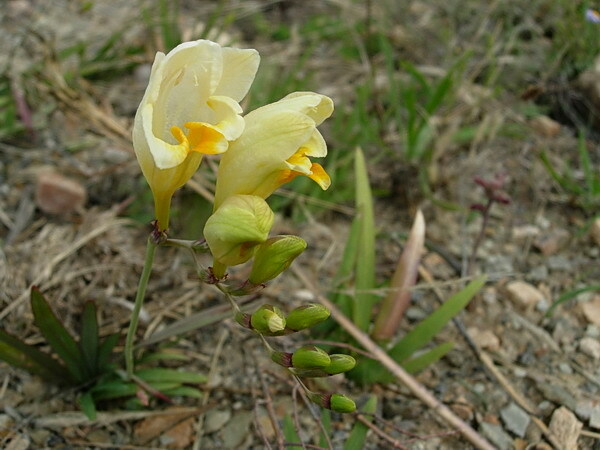 Freesia verrucosa (B.Vogel) Goldblatt & J.C.Manning, syns. 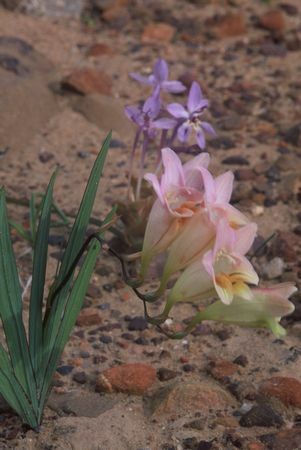 Anomatheca verrucosa and Freesia juncea, grows in clay soil in renosterveld in the Karoo mountain center and the southeastern Cape. Plants occur in small colonies along roadsides or in stony washes. Growing from 8 to 20 cm high, this species has 7 to 10 suberect blunt leaves about one third as long as the stem with slightly undulated margins and a thickened midrib. Bracts are short (4 to 5.5 mm) and flowers are bright pink with either the base of lower three tepals or the medial tepal with a whitish or pale yellowish blotch outlined with dark pink. Flowering occurs in spring, late August to October, with the unusual feature of the flowers closing up completely at night. The first photo from Bob Rutemoeller is of plants grown by Alan Horstmann. The second from the book Plants of the Klein Karoo courtesy of Jan and Anne Lise Schutte-Vlok. Freesia viridis (Aiton) Goldblatt & J.C.Manning, syns. Anomatheca viridis and Lapeirousia viridis (Aiton) L.Bolus grows from 10 to 30 cm high with 4 to 8 suberect or rarely prostrate variable leaves and a deflexed spike of green flowers strongly flushed with brown or maroon. The stem is unusual in that it is flattened and 2-winged, usually simple but with up to five branches. It is distributed through the western coastal winter rainfall areas from Namibia to north of Cape Town in the southwestern Cape. It is found in a variety of habitats and soils from stony clay and limestone to occasionally sandstone and flowers winter into spring (May to August, rarely to October). Some populations are unscented during the day and rose scented at night. Leaves are bitter which may make it unpalatable to animals and has allowed it to persist in overgrazed veld. This is more of a collector's plant. In captivity it sets seed very readily since it is self-fertile and can spread itself to other pots if not watched carefully. 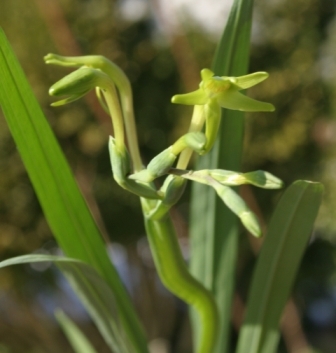 Two subspecies were recognized when this plant was known as Anomatheca viridis, but later abandoned and not included when first moved to Freesia. In the latest monograph Manning and Goldblatt have restored the subspecies based on differences in leaf margins, flower shape and color, as well as geography and habitat. 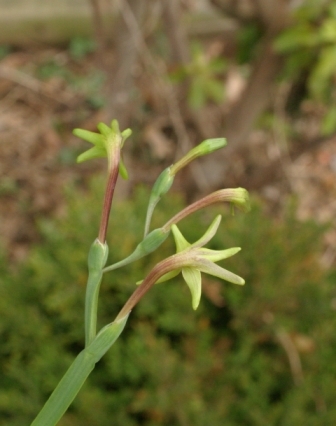 Freesia viridis ssp. crispifolia (Goldblatt) J.C. Manning and Goldblatt is distributed along the near interior of the west coast from Namibia to Clanwillian. It is often found wedged in crevices of rock outcrops and growing in a variety of soils. Leaves have strongly crisped margins and the brownish green to maroon flowers are shorter with blunter tepals than the other subspecies. Flowers are unscented. Freesia viridis ssp. viridis is a coastal subspecies growing in pockets of loamy soil in granite, shale or limestone outcrops in coastal thicket within sight of the sea or in rock crevices. Leaves are narrowly lanceolate and soft-textured with plane margins. 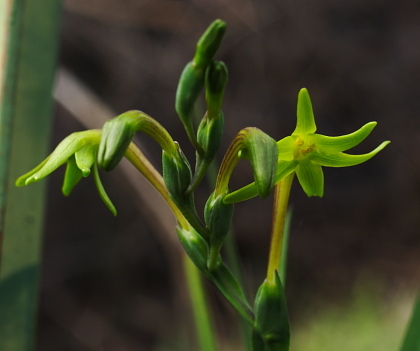 Flowers are yellow green, sometimes flushed with dark maroon with rather slender and tapering tepals. Some plants in the wild have been found to be fragrant at night. The first photo is by Nhu Nguyen showing the flower and fruits. The second and third images photographed in the Montgomery County, Maryland, USA, USDA zone 7 garden of Jim McKenney show the same cold frame grown plant blooming (on the left) in 2007 and (on the right) in 2008. Note the difference in color. 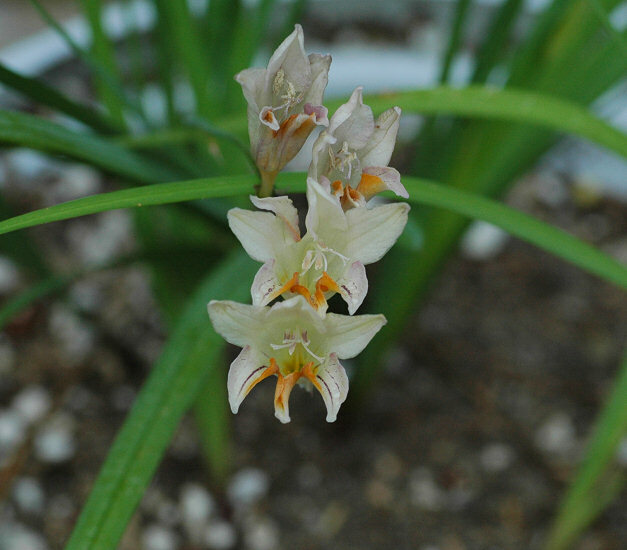 The fourth image was taken in cultivation in California by Michael Mace. The last two images taken by Mary Sue Ittner are of a plant she discovered growing in the ground many years after she had stopped growing it. She was very surprised to see it after all that time as she had never saved seed and was growing it in a container in another location. She thinks it is unlikely anyone else would be growing it where she lives in California.